What does it mean to have diversity at workplace? Most often people misinterpret diversity! Is it just gender, culture or race alone? Or something else? Often times organizations make investment in Diversity and Inclusion initiatives but when it comes to using a common language in place and educating the employees about it, organizations miss the mark. Each Organization have their own model of diversity and inclusion and yes, indeed, everybody speaks the same word ‘Diversity’, but when it comes to employees, it means something different to almost everyone in the organization. on Wednesday, 14th August 2013 at 8 PM IST. Here are some thoughts that we will be discussing! What does it really mean by diversity at workplace? How to manage diversity in the workplace? What is the actual role of culture and its communication when it comes to diversity and inclusion? What are some metrics that HR & leaders of the organization should pay attention to when it comes to recruiting for diversity? How & why should organization promote diversity among workplace? 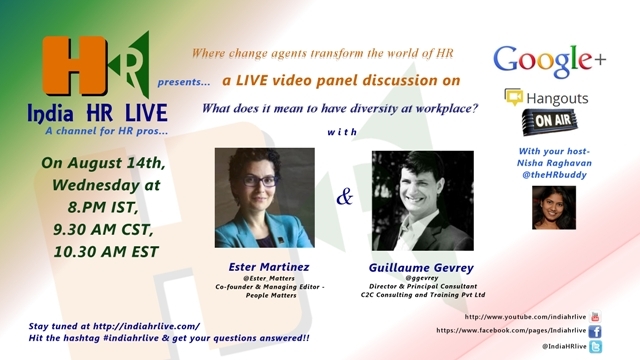 Join us while we discuss Diversity & Inclusion! channel http://www.youtube.com/user/IndiaHRLIVE/live during the scheduled time.